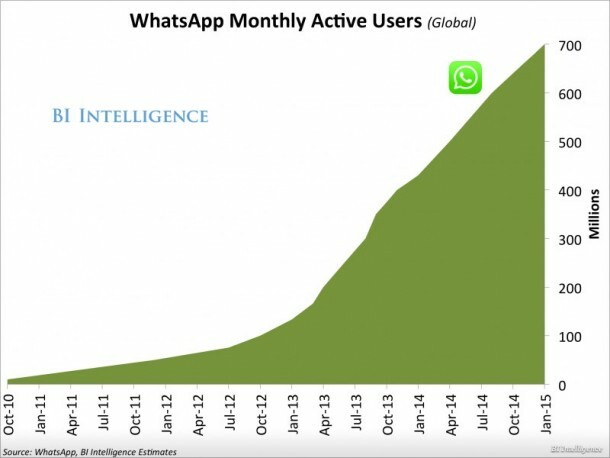 No matter how popular is WhatsApp it still keeps growing more and more. It is now under the umbrella of Facebook, and can maintain its growth over the last two years and reached 700 million active users, the next milestone in early 2015. As a Infographic from Business Insider is wonderful, the slope curve of its growth remains faithful. In one the day there can be 30 billion messages on the server, as inventor Jan Koum announced yesterday. These are absolutely impressive numbers. As you can see, WhatsApp came out of nowhere three years ago. We see once again shows how quickly the success can be extremely grow in this industry.